While yesterday's snow day made it clear that winter is not ending anytime soon, that won't stop me from daydreaming about spring and warmer days. I'm especially looking forward to spring style, which, to me, is all about light layers, bright colors, and fun florals (however cliche that may be). I always feel like winter to spring is one of the more awkward transitional periods when it comes to style, so I like to start introducing spring accents into my outfits through accessories first. Statement Necklaces are perfect for this. Below are a few of my favorites for the upcoming season. I especially love this year's J. Crew spring jewelry collection. Their exciting vibrant colors are so on point. 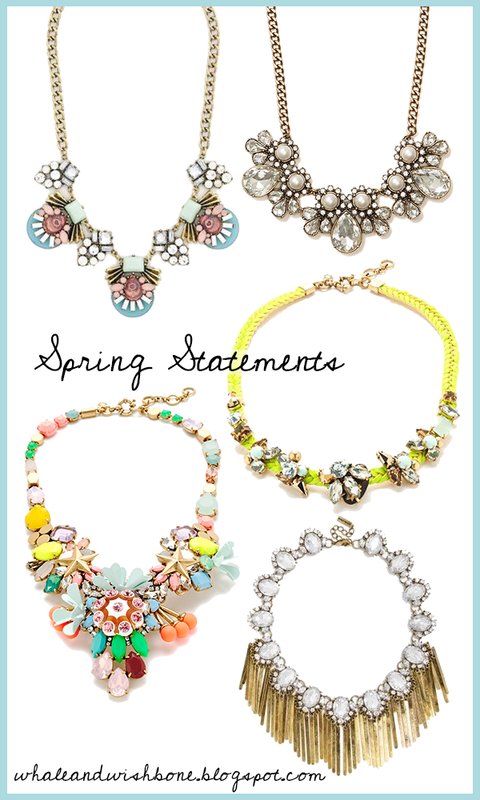 Fingers crossed that weather as beautiful as these necklaces is just around the corner. But until then, keep warm and stay positive.